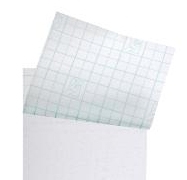 OPSITE FLEXIGRID Film Dressing is a transparent, adhesive film, with a unique wound measurement grid. The film is moisture vapor permeable, conformable and extensible. It is widely used to provide a moist wound healing environment for superficial wounds; it is also ideal for use as a secondary dressing. It features a superior film with acrylic adhesive. It is a waterproof film. Opsite Flexigrid has a simple, effective application technique and is adaptable to awkward areas. Measurement and sizing is simplified and made more accurate with the unique wound measurement grid. OPSITE FLEXIGRID provides a simple and effective application system. The flexible carrier enables single-handed application allowing the dressing to conform to the contours of the body. Its transparency enables accurate positioning over the wound site. OPSITE FLEXIGRID incorporates a unique wound measurement device, which allows simple but accurate assessments of the healing process to be made. After tracing the edges of the wound, the Flexigrid carrier can be removed and stored in the patient's notes. -Use as a secondary dressing, for example over INTRASITE Gel Amorphous, Hydrogel Dressing or ALLEVYN Cavity Wound Dressing. -The patient should be receiving suitable systemic treatment. Immuno-compromised patients and diabetic patients may require extra supervision. Care should be taken to avoid skin damage by repeated applications on patients with thin or fragile skin.